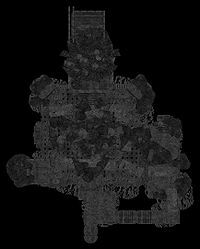 This article is about the dungeon portions of Castle Volkihar which contain enemies. For the portion of the castle inhabited by the Volkihar vampire clan, see Volkihar Keep. 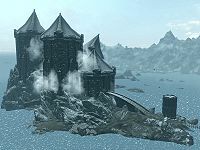 Castle Volkihar is a large fortress on an island far west of Solitude, north-northwest of Northwatch Keep. 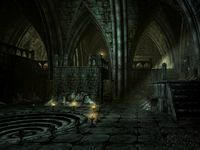 The dungeon areas of the castle, most of which contain enemies, include four interior zones: Volkihar Undercroft, Volkihar East Tower, Volkihar North Tower, and Volkihar Ruins including Valerica's Study, and two additional external zones: Volkihar Courtyard and Castle Volkihar Balcony, which is the nearest fast-travel point to Valerica's Study and the Soul Cairn. 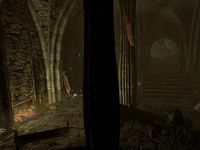 Though you can travel to the island immediately upon installing Dawnguard, the dungeon areas of the castle are initially inaccessible due to the external door being locked and requiring a key. The door is unlocked at the start of the Chasing Echoes quest. To reach the entrance travel from the jetty on the island, reached either by fast traveling to the island or utilizing the rowboat at Icewater Jetty. Then follow the shoreline to the left of the castle until you reach a crumbling, disused dock where there are several sunken boats and ships. The docks are guarded by four leveled skeletons armed with ancient Nord weapons, which may be honed. They are significantly tougher than typical skeletons, most are magic-users and graphically they appear to be wearing armor. There are plenty of salmon that can be fished from the docks. Deep below the water is an overturned sunken ship, with a broken keel. The hull has split open just enough to grant access below deck. Among some crates is an unlocked chest containing minor loot. Unless you are an Argonian, you will need to use a waterbreathing effect, via a potion or enchantment to reach it. A light spell would also be a boon. To locate the ship, swim from the far end of the dockside to the northwest. There are numerous stairs rising up from the dockside to terraces far above. 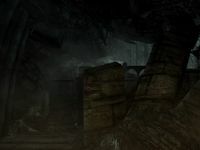 At the top is an entrance to Volkihar Undercroft, which prior to starting the related quest is the door that is locked. The entrance leads to a balcony with stairs leading down on the left. There is a skeever wandering this area, which will attack as soon as it is aware of you. You'll also find several loose septims and some clam meat on the floor among the straw and bones. The stairs descend to a landing, with a barrel of ingredients by a stone railing, which has a woodcutter's axe stuck in the top. On the right are some crates and food sacks beside the wall. There is an unlocked wooden door in front of you, to the north, with stairs leading down on the left, to large double doors also to the north. The single door opens onto a balcony overlooking the old water cistern, which can be used to snipe at those in the next room. The double doors lead into the same room at floor level. There are up to five death hounds and a feral vampire inhabiting this area. The feral vampire is carrying a journal fragment, which explains how she's been taking control of the keep's death hounds and promises revenge against the vampires living in the keep. If you return here after the quest only the death hounds respawn. The central third of the room is sunken and was originally used to collect water for the cistern. There are stairs descending down into it at the far end. On either side are paths with a stone bridge linking them near the balcony. There are alcoves on either side, with grating over water filled tunnels. Just beyond the first alcove on the left is a barrel of ingredients. In the southeastern corner are several coffins and a dead draugr. One of the open coffins contains a skeleton that can be looted, in addition to a couple of the coffins and the draugr. There is a medium coin purse in the bottom of the other open coffin (see bugs). The first alcove on the right-hand side of the room contains an adept trapped chest, that triggers spears to shoot up from the grating in the floor. To avoid damage either disarm it before opening the chest or simply stand at the bottom of the stairs and not in the alcove. At the back of the room, stairs ascend to a higher level that continues around to the west. An alchemy lab is to the left of stairs up into another room, with a salt pile and a bottle of weak aversion to magic poison on top. While to the right of the stairs are a set of shelves holding a pair of vampire gauntlets, a hide helmet, a leather strips, a potion of minor healing, a salt pile and a food sack. The room has a small table and chair on the right and a barrel of ingredients in the corner, beside a narrow table against the rear wall. On the table is a copy of the Destruction skill book A Hypothetical Treachery, a copy of The Aetherium Wars, a random potion of magicka, and a rarely seen item of clutter, a bloody tankard. Under the table is a pair of vampire boots. To the left is an upright coffin you can sleep if you are a vampire. To the left is a small unit that holds a small coin purse and a bear trap. On the left is a lever with a path heading west below it from the main room. There is a raised bridge blocking the path, which is operated by the lever. The passage heading west has an alcove on the left containing an iron dagger by a skeletal hand protruding from under grating in the wall. Once the bridge is lowered, the path leads to the middle of the next room with fire hardened stakes in a partially flooded area around you. If you fall down there is a passage leading back up in the northwest corner of the room. Take care however to avoid the stakes as they can take a serious amount of health very quickly. The passage has four bear traps along its length, a skeever wandering the passage unless it has fallen foul of one of the bear trap. Near the top of the passage is a skeletal magic-user armed with an ancient Nord weapon. There is another raised bridge in front of you and a path heading south, past three strings of infected bones. If you are neither vampire, nor werewolf, take especial care as you have a significant chance of contracting at least one disease from touching them. 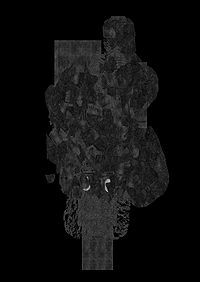 Once past the infected bones the passage turns to the west, passing an easily avoided string of bone chimes and leading into split-leveled room with piles of bones covering most of the floor and bookcases filled with ruined books flanking the doorway. Up to three death hounds inhabit this room, which have balconies on most sides. There are stairs rising to the south. As you enter the room a trap door opens in the ceiling a some more gory bones fall to join the piles below. The stairs lead up to a torture area with shackles bolted to the wall with blood splattered on the wall and floor below. Two small wardrobes containing a selection of fine clothes and boots. On top of which is a bottle of weak lingering poison, a phial of frostbite venom, a potion of cure disease, a potion of minor healing, two salt piles, some leather strips and a woodcutter's axe. More stairs lead up to a passage heading east, before turning north. At this point you are faced with two thick walls of cobwebs that you need to hack or burn your way through, to the north and east. The latter of these conceals an adept locked chest, while the former blocks the passage and conceals a giant frostbite spider in a room containing a barrel of ingredients and the second lever needed to lower the other part of the raised bridge. There is even a round grating looking down on the bridges. Before returning and taking this new path, there is a wooden door to the south, that opens onto one of the balconies in the previous room. Opposite is another balcony that can readily be reached if you are a vampire lord using your Bats lesser power or with at least two words of the Whirlwind Sprint dragon shout. You can also reach it by repeatedly jumping near the opening up to the ledge. Once there, there is a skeleton with a random potion of healing in its hand, a medium coin purse and knapsack beside it. At the other end of this balcony is an unlocked chest. Once looted, you can drop to the room below and backtrack to the crossroads. From here make your way up several flights of stairs to a door leading outside to the Volkihar Courtyard. 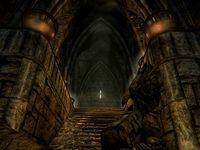 Through the door are steps leading up into the courtyard, which has obviously been left untouched for countless years, as it was once the domain of Serana's mother Valerica. Serana will inform you that something is wrong with the large moondial on the ground, it is many paces wide and in the center of the courtyard. It appears three of the crests are missing, namely; the Full Moon, Half Moon and Crescent Moon crests. Serana will inform you, if questioned that the moondial was crafted for her mother by an elven artisan from an old sundial that was put here by the previous occupants of the castle and that it was special to her mother. There are many dead trees and gravestones around the edges of the courtyard with stairs leading up to doors to the southeast, northeast and west. The door to the west has collapsed due to a cave-in, allowing no access through there. In fact the courtyard has suffered quite a bit of damage, which Serana will suggest was caused by her father, going on a rampage when she and her mother left and then blocking off anything which reminded him of his wife and daughter. There are several gargoyle statues near each of the exits from the courtyard, but none burst to life. They are either above the doors or on the railing of the stairs leading to them. There are many hanging moss growing from the limbs of the trees and down the walls that surround the courtyard. To the northwest is a small pool of water with five tufts of spiky grass, four swamp fungal pods and one patch of blisterwort fungus growing around the edge. In the middle of the pool is a large rock with the missing half moon crest lying on it. There is a planter containing a deathbell plant and another with jazbay grapes growing in it at the top of stairs to the northeast. They are on either side of the door to Volkihar North Tower. To the right of this are stairs leading up to a terrace with a large planter on your right with a patch of Namira's rot and blisterwort fungi growing in it, a wooden bench to the left and against the railing in front of you is a large round table and chairs, which would once have been a pleasant place to sit. Beside the table, on the ground is the missing crescent moon crest. At the rear of this terrace is another cave-in with masonry piled up blocking another doorway. To the south is another planter, this one is empty. Beside the planter are more stairs leading down to a door to the Volkihar East Tower. The stairs to the west lead up to more terraces with planters containing a patch of blisterwort fungus and a canis root at either end. There are more tables and chairs in this area. To the east are nine nightshade plants growing behind a small walled garden with the missing full moon crest among the vegetation. During the related quest Serana will stand by the moondial, allowing you to explore both of the towers unaccompanied. You access Volkihar East Tower from Volkihar Courtyard, through the door to the east. It consists of only one room filled with rubble and crushed skeletons which cannot be looted. There are no enemies in this tower, only several flights of stairs leading up to the rear. At the very top of the stairs, partially buried by masonry is a skeleton, with a small coin purse, an amethyst, a garnet, a sapphire and at least eleven loose septims littering the steps as if dropped as the person was crushed. Down one flight of stairs and behind the rubble to the west is an unlocked wooden chest containing minor loot. There is nothing else of value in this tower. Volkihar North Tower is the larger of the two towers accessible from Volkihar Courtyard, through the door on the north side. Through the door is a room containing various empty furniture and stairs descending to the east. In front of you is a doorway out onto a balcony above a large room containing two skeletons. One is standing facing the balcony you're on, at the bottom of the stairs opposite. The other is sitting on a bench in front of the fireplace below you to the left, facing away from you. The balcony is an ideal sniping point to deal with both of these. The stairs to the east lead down to a smaller room containing another skeleton sitting on a bench, with two small wardrobes containing a selection of fine clothes and boots on either side of an adept locked door. There is also a doorway out into the lower level of the room beneath the balcony. Behind the locked door is a flight of stairs blocked by a cave-in with a crushed skeleton beneath the masonry, holding a silver jeweled necklace with two gold ingots and a garnet on the stairs beside it. Through the doorway into the larger room, there are statues of a gargoyle in the northeast and northwest corners of the room. However, only the one in the northeast corner will burst to life and attack you when it detects your presence. To the left of the gargoyle is an unlocked wooden chest. Along the west wall to the right of the fireplace is a set of shelves with a flawless garnet hidden among clutter, on one of the shelves. Up the steps to the far north and through the open double doors is more fallen masonry blocking more stairs. An expert locked chest is found among the rubble. Under a balcony in the southwest corner is a wall shelf with a drum on it. This second balcony can be reached using the same options as before, either Whirlwind Sprint or the Bats power gained as a vampire lord. There is an unlocked chest among more masonry on this balcony. Volkihar Ruins cannot be accessed until you complete the moondial puzzle in Volkihar Courtyard during the related quest. Upon replacing the three crests, a passage descends, spiraling around the center of the dial, leading to a door in similar fashion to the passages to Blackreach found using the attunement sphere on the Dwarven mechanism at the end of Alftand, Mzinchaleft and Raldbthar. Through the door at the bottom is a passage with stairs leading up to a dead end. There are units on either side holding a bottle of alto wine and two coin purses, one small and one large. There is also a pull chain to the left, which opens a concealed door in front of you. There are three pieces of firewood and a metal bowl on the floor behind the concealed door. The room beyond is used as some type of kitchen having a bloody table in the middle, covered with bones and gore. Around the room are several counters, wall shelves and tables all covered in gory detritus, as well as a total of six salt piles, a piece of canis root, a bowl of troll fat, and a woodcutter's axe. Hanging from the ceiling is a bunch of dried elves ear, a bunch of dried frost mirriam and a garlic braid. In the middle of the east wall is an old extinguished fireplace containing three more pieces of firewood, with a cooking pot in front, which can strangely still be used to cook with. To the right is an alcove filled with unusable barrels, while to the left is a flight of stairs that are also covered in blood. They lead up to a door. During the related quest Serana will start stating from this point onwards that "We're getting close, she's sure of it". Through the door is a large dining room containing a very long run of tables placed end-to-end with seven skeletons, most of which are the tougher type that appear to be wearing armor. As soon as you enter the room, the room will light up as if there was a light source over the table and the twin fires in the fireplaces on the east will also light. There are empty wine bottles on the table and scattered on the floor, along with several narrow tables and sets of shelves against the walls. A drum and flute are by the south wall on or in front of a set of the shelves. There are raised sections with stairs leading up to them at either end of the room. There is nothing of interest on the raised section to the south, only another blocked passage. On the northern section are some wooden benches and a small bookcase, filled with ruined books. 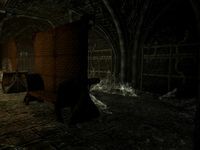 To the left of the bookcase is a flight of stairs leading up to a heavily vaulted room with thin cobwebs and strings of infected bones hanging from the ceiling. On the far side of the room is a leveled gargoyle with braziers on either side. As soon as you enter far enough into the room, these will light up and the gargoyle will burst to life and attack. The only items in the room are a couple of leather strips; one in the middle of the floor, and the other on a narrow table to the right of a door in the southwestern corner. In the southeastern corner is another passage, but it is blocked just around the corner by fallen masonry. The door in the southwest corner opens into another room with several wall shelves on the wall opposite holding various animal skulls all the way up to a shelf high overhead holding the skull of a mammoth. To the right of this wall are wide stairs up to a raised section where two armored skeletons are sitting on benches. To the right of these are a series of flights of stairs leading up. To the left is an adept locked wooden door, which opens to a small cupboard containing a barrel of ingredients, with some leather strips on top and a set of shelves holding a steel dagger, an empty random soul gem, two lockpicks, four loose septims and a cast iron pot hiding a sapphire, an amethyst and a medium coin purse. As soon as you start climbing the long flight of stairs, rows of braziers on either side will light up. Around the corner to the left are some more strings of infected bones hanging from the ceiling, a couple of desks against the wall, holding seven loose septims on a plate, a random potion of healing, magicka or stamina, a sapphire and a flute. Above these is a small balcony and nearby, just out of sight are a couple of armored skeletons. To the right, in the southern corner is a leveled gargoyle that will burst to life and attack soon as you are near. The balcony can be reached by following the room to the right of the desks, passing under a fallen piece of masonry and climbing the stairs beyond. At the top, on the right is a statue of a gargoyle, while opposite is an open door. There are more stairs at the back of the room, but they only lead to two empty planters, with a balcony high above these patrolled by at least one armored skeleton. Through the door, on the right is a blocked stairway, while to the left is an open door. There are two small wardrobes against the left-hand wall containing more fine clothes. Beyond these in the southern corner are a small balcony and an adept locked door. Through the door is the balcony over the desks, with an unlocked chest in the corner. Looking back at the door you originally entered this room through, you will see a shield rack holding a banded iron shield and crossed iron greatswords. Against the right-hand wall are more stairs leading up to an area with a table and chair holding a common book, a piece of leather and some small shelves at the back of the table holding some rolls of paper, a scroll of fire storm and two lockpicks. There is another common book on the floor, beside the chair. To the left of the table is a set of shelves holding a further six common books and a lute. To the northwest is an open door into a larger room, with two long unlocked chests against the right-hand wall and two doorways on the left and one in the northern corner. Both the rooms on the left are bedrooms, but both beds have been broken and buried by falling masonry and are now unusable. There is nothing of interest in either room. In the northern corner is a flight of stairs leading up to a door, the room beyond is another dining room, with several raised sections. There are three armored skeletons in this room. Behind the door is a small wardrobe containing yet more fine clothes. To the right a flight of stairs descend to the main part of the room, where two extra long wooden tables are arranged with chairs along either side. 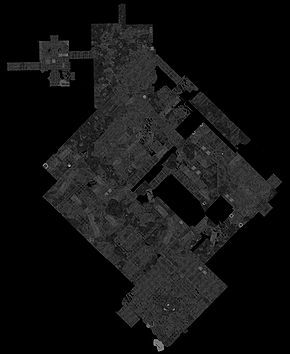 There is a blocked passage to the southeast and a wider passage to the northwest that is also blocked. At the rear of the room is a raised section with stairs along the rear wall leading up to it. At the top, on the left is a lowered wooden portcullis, while at the far end is another leveled gargoyle with a pull chain behind it. As soon as you pull the chain it will burst to life and attack. There is also an armored skeleton through a door in the southern corner. This is the balcony over the two planters seen previously. On either side of the gargoyle and in an alcove to the east are several sets of shelves, desks and a table and chairs, but these only hold clutter. Once the gargoyle has been dealt with, you can pass under the now raised portcullis. A pull chain on the right operates it from this side. There are also wide stairs rising to the northwest, with an armored skeleton partway up the stairs, just past a large piece of masonry. There seems to be quite a lot of sunlight coming through windows to the side of the stairs. As you near the top of the stairs yet another leveled gargoyle will burst to life and attack. On the left is another lowered wooden portcullis and a chapel beyond, with the chain to operate it on the right. To the northwest is an expert locked wooden door. Regardless of which route you take you will end up in the same place. 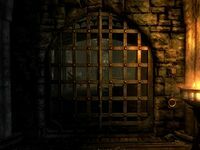 If you choose to raise the portcullis and enter the chapel, however, you will have to backtrack to complete the exploration, making the route through the expert locked door preferable if you want to fully explore this area and collect all the treasure available. The chapel has a walkway forming an arch overhead, with an armored skeleton patrolling backwards and forwards across it. There are also balconies on both sides of the room, with a skeleton on each and underneath are two more armored skeletons sitting on benches. Inside the chapel in a shambles, there are pews piled up in two large heaps and behind the pulpit there are some screens with an unlocked chest behind one of them in the eastern corner and a small cupboard opposite containing a few septims and clutter. Through the expert locked door is a passage leading up, around a corner and into an armory. There are a total of twenty-five weapon racks on the walls holding fourteen ancient Nord weapons, a random enchanted bow and a random enchanted two-handed melee weapon. There are four wooden benches down the center of the room backed by screens and four sets of shelves holding three random potions of healing, magicka or stamina, a draught of strength, two bottles of alto wine, and a bottle of wine. To the southwest is a short flight of stairs up to a third portcullis, again with the chain to the right. Past this is another blocked flight of stairs with a doorway on the left. Through this door is a passage that links the chapel, the balconies and walkway. The balcony on this side is right by the door, with the other directly opposite, the walkway is to your left and you can access the chapel below by turning right. Any fighting is likely to alert all the skeletons to your presence. Once you've dealt with all these and explored below, crossing the bridge leads to a passage with a series of flights of stairs leading up to an unlocked door. The room at the top has a row of tables laid end-to-end with a skeleton laid out with various other bones and skulls, you are unable to loot this skeleton. 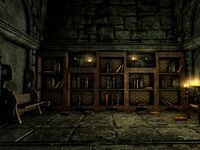 There is a long unlocked chest against the southwest wall, several small tables and chairs and a few sets of shelves around the room, but the only item of interest is a random potion of healing, magicka or stamina on a shelf against the northwest wall, to the left of yet another door. Through this door is a blocked passageway on the right and stairs leading up to large double doors. These open into a large room with a high vaulted ceiling. Six gargoyle statues are in the room; two on the left, two in the middle and two on the right. One of each of these will burst to life when approached, one of which is the highest level possible. Once they are dealt with, during the quest Serana will wonder if we are at the top yet and whether there is a secret entrance in the room. There is a long wooden table in the center of the room with two iron daggers and an iron warhammer on top. In the southern corner are two unowned upright coffins you can sleep in, if you are a vampire. Between these is a small wardrobe containing fine clothes and with a set of shelves on top, holding a set of the rare vampire royal armor and a silver sword and beside the wardrobe are a pair of vampire boots. 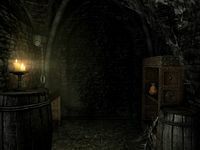 Against the rear wall of the room are two sets of shelves filled with more empty wine bottles and the shelves on the right also hold a scroll of conjure familiar. There are three pieces of firewood laid in what appears to be a fireplace, but if you turn the wall mounted candlestick on the left, the wall will open up revealing another passage. Follow a series of flights of stairs as you climb, winding around with each flight to a door at the top. Through the door is Valerica's Study. Valerica's study is a large room on two levels, with a large circular space in the center of the lower level, surrounded by candles. This is where the portal to the Soul Cairn opens during the Chasing Echoes quest. There are stairs against the east wall leading up to the north and the raised section. After the death of Lord Harkon, if you choose to inform Valerica, she will again take up residence here. To the left of the library, against the southwest wall is a long wooden table with a built-in alchemy lab. Also found on the table among bones and skulls both human and animal, including a dragon bone (see notes) are two bowls of normal bone meal and a stone bowl containing finely ground bone meal. This last item is not an ingredient, but will be found under misc on your character's items menu. In the southern corner there is a flight of stairs rising up to a door leading outside onto the Volkihar Balcony, which is the nearest location to the portal leading to the Soul Cairn you can fast-travel to and from. The first time you use the door a map marker is added to your in-game map as a fast-travel point named Castle Volkihar Balcony. 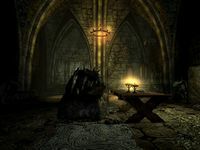 Against the southeast wall are two long unlocked chests with wall shelves filled with candles above them and a narrow wooden table between them with three built-in soul gem fragments and an built-in elven dagger on top. † These are a unique bone meal and can be used to create potions with the same effects as regular bone meal. In addition there is a copy of the Alchemy skill book De Rerum Dirennis on one of the shelves. In the eastern corner between the upper level and the stairs are more sets of shelves holding mostly clutter, two lockpicks and a copy of the Sneak skill book The Red Kitchen Reader. The stairs up to the upper level pass two small wardrobes containing a selection of fine clothes and boots, with two empty black soul gems, an empty and filled common soul gem, an empty grand soul gem and six soul gem fragments on top. Also on top and not to be confused with normal soul gem fragments is a stone bowl containing soul gem shards, which are needed to create a portal to the Soul Cairn. In addition to these ingredients there is a stone bowl containing a sample of purified void salts, which are not an ingredient, but will be found under misc on your character's items menu. There is also a random potion or poison on top of the alchemy lab on the upper level and another on one of the long tables, with a potion of blood added to the table after Valerica returns, and takes up residence in the castle. 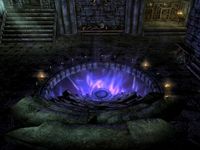 There is a central balcony sticking out towards the portal area on the lower level, it is without a railing along the front, and on the left-hand side is a "portal vessel", which is where the items used to open the portal that leads to the Soul Cairn are placed during the related quest. Once the portal is open, stairs will lead down from this balcony to the portal in the center of the lower area. It will remain open permanently. The vampire royal armor that is located in the room with the three gargoyles in Volkihar Ruins is one of the few places that this armor can be obtained, and the only one that respawns. Valerica's Study is the only location in the game where you can acquire a dragon bone without defeating a dragon. 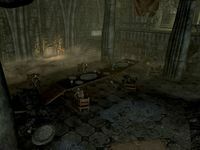 After completing Dawnguard's main questline on the Volkihar side, it is possible to repair the path to the Volkihar Courtyard inside Volkihar Keep by talking to Garan Marethi. This repair is free of charge and adds a convenient entrance door to the courtyard for quicker access to all dungeon locations. If the Dawnguard eradicate the vampires who control the castle, picking up any items in the castle will still count as stealing. If you return to Volkihar Ruins via the courtyard entrance and pull the very first chain again, the door will close with no way of re-opening it except by reloading a previous save or exiting/entering the area. You can use the console to teleport past the gate if Serena was bugged when you get there. The command to get in is (change by 1 to get out): cow Tamriel -44,36 ? In the Undercroft is an open coffin containing a coin purse that you may be unable to interact with. Using the console command tcl enables you to reach the coin purse which is interactive but has been placed out of reach of the player. Followers are not able to enter the North Tower or East Tower due to unfinished navmeshes. This bug is fixed by version 2.1.1 of the Unofficial Dawnguard Patch. This page was last modified on 2 September 2018, at 17:24.